Greenwater Cove, mostly destroyed, circa 2E 582. Greenwater Cove sits between craggy cliffs and jagged promontories which soften and rise still further to form the white granite mountains to the east of the town. 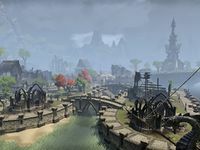 The unwalled settlement provides a safe haven for ships traversing the Greenwater Sound, the narrow strait which separates western Vafe from Summerset Isle, and which connects the Abecean Sea with the inner waters between Auridon and the biggest island of the archipielago. Greenwater's surroundings have towering escarpments, secluded coves, hidden sea grottos, lush coloured woodlands, and pale off-white sand dunes. The locals try to tame the rugged but beautiful countryside, however, much of western Vafe is wild, untouched coasts and forests. This environment also gives wildlife of all sorts, like giant snakes, the chance to spawn and thrive. 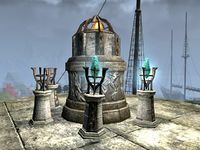 It is unknown when Greenwater Cove was exactly founded, but its port and its ancient Aldmeri defenses dates to the Late Merethic Era, when it was commanded the construction of the Eye of the Ancients, an artifact capable of destroy autonomously enemy ships powered by a series of Welkynd Stones, kept jealously by town's authorities. The Stones provided the energy to channel a beam of pure fire towards the objectives. The Eye was built upon the eastern cliffs of Vafe to defend the strategic Greenwater Sound. The technology necessary to its construction was lost by the Second Era. However, this Aldmeri artifact was still in function by 2E 582 and capable of sinking an entire enemy fleet. Maormer have been always aware of the existence of the Eye of the Ancients and its powerful beam. However, they also know most of the time is inactive and must be put into function by the locals. This information was very useful when the Sea Vipers, led by Captain Parondo, under the orders of Admiral Herculoa and with the Veiled Heritance's assistance, took the town by sea in 2E 582, so easily and swiftly that the Canonreeve was unable to activate the Eye, and the First Auridon Marines barely had a chance to react. After Greenwater fell to the Maormer invaders, the First Auridon Marines established a cordon around the town, with the only goal to hold the Sea Vipers there until reinforcements came. Fortunately, a member of the Eyes of the Queen came to town and managed to kill Captain Parondo and activate the Eye of the Ancients, allowing the Marines to retake Greenwater. Many citizens were killed during the Maormer sack of the town, including the Canonreeve, researchers from the Mages Guild and many First Auridon Marines. Rebuilding works began just after the last of the Maormer were repelled to the sea, however, much of the town was already razed down. The Maormer fleet that threatened Auridon, the Sea Viper, was driven into the seas around Auridon by the Three Banners War, seeking their own victories in the war between the alliances. The First Auridon Marines and the Dominion Navy stood ready to halt the advance of the Maormer and gave instructions to the coastal townsfolk to report any sign of Maormer activity at once to their nearest authority. After the Veiled Heritance conspiration in Mathiisen was suppressed by Eye of the Queen agents and both the former Canonreeve and Forgemaster were replaced after their execution in 2E 582, High Kinlord Rilis XIII was not happy about the town's implication in the conspiration against the crown and decided to try to supply their First Auridon Marines with steel from the forges of Greenwater Cove, however, his attempt was unsuccessful, as the town was razed that same year. It is unknown if the town was effectively rebuilt and was still in existence during the Tiber Wars or the Imperial Simulacrum. Greenwater Cove has been an integral part of the realm of the Summerset Isles since its foundation. A Canonreeve is tasked to rule the settlement, who is also responsible of activating the Eye of the Ancients in case of attack by sea of the town. The town's main role is to defend the northern entry to the strategic Greenwater Sound, protected by the Eye of the Ancients of enemy fleets. The Mages Guild studied the relic for a long time but were unable to truly understand how it works. However, most of the time, the Eye is inactive to avoid friendly fire towards the trading and war ships passing by the busy docks of the town. 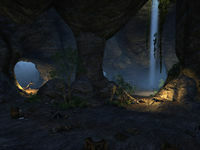 Greenwater Cove's forges give some of the best steel from all of Auridon, second only to those of Mathiisen, however, unlike the latter, Greenwater is only capable of supplying local needs. Husbandry is also an important activity in Greenwater. The farms around the town supply meat to Auridon and even export some of their product to Valenwood. This page was last modified on 3 November 2018, at 08:04.